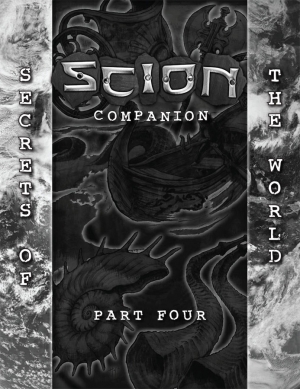 Scion Companion Part Four: Secrets of the World Available Now! Secrets of the World contains a variety of Storyteller suggestions and articles to help expand your Scion cycle. There’s information on politics between the Gods and their Scions, more information on feats of strength, more equipment and weapons (including new Relics), a new antagonist group (the Order of the Divine Glory), information on Legendary companions for Scions, step-by-step advice on how to create your own pantheons, titanspawn and Relics, and 26 new story ideas for your cycle. The Scion Companion is a joint venture between our traditional and alternative publishing divisions, to provide you periodical content for Scion without leaving behind fans to love our hardcover books. The first four sections will be released as individual PDFs over the course of the next several months. The final two sections of the book (a third pantheon and a new background for Scion cycles) will appear in the final release of the Scion Companion, which will be for sale online and in stores as a hardcover book, as well as a complete PDF release combining all of the sections. Secrets of the World is available at the Flames Rising RPGNow Shop. Exalted: Lost Arts of the Dead Now Available!